Join internationally celebrated author and “Champion Mojo Storyteller” Joe R. Lansdale for a special event at the Wittliff Collections, which house his archive. The author of nearly 50 novels in a variety of genres, Lansdale has won an Edgar Award, nine Bram Stoker Awards, and in 2007 he received the World Horror Convention Grand Master Award. The New York Times describes Lansdale as having “a folklorist’s eye for telling detail and a front-porch raconteur’s sense of pace.” Author of the cult classic Bubba Ho-tep, Lansdale’s latest novel to be adapted into film is Cold in July, starring Don Johnson, Michael C. Hall, and fellow Wittliff donor Sam Shepard. 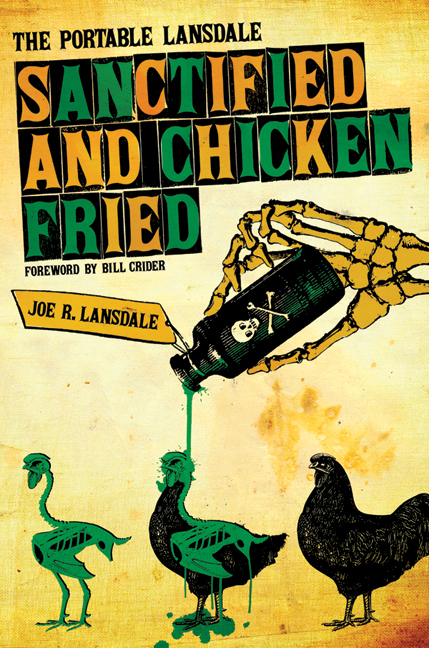 An anthology of his work, Sanctified and Chicken Fried, is part of the Wittliff’s literary book series with the University of Texas Press. Joining Lansdale will be journalist Wes Ferguson, whose book, Running the River: Secrets of the Sabine, with photographs by Jacob Croft Botter, is being compared favorably to John Graves’ Goodbye to a River. Also on the bill is Joe’s daughter, singer-songwriter Kasey Lansdale, who will perform from her new album, Restless, produced by John Carter Cash. Her songs “Back of My Smile” and “Foolin’ Around” are featured in the film Cold in July, which was adapted from Joe Lansdale’s novel. Books and other items will be available for purchase. A signing will follow the event.